In a sign of the major progress Universal Basic Income (UBI) has made in Asia, the United Nations Development Program in Beijing hosted a roundtable discussion on basic income last week. 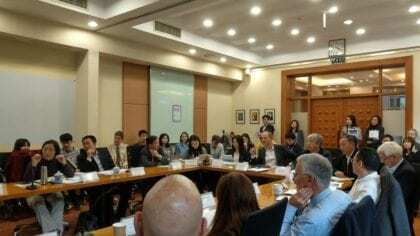 Professors from China’s most influential universities spoke at the roundtable about the potential for a basic income pilot program in China. Patrick Haverman is the UNDP Deputy Country Director for China. Haverman said he wants to work with academia and government to determine if basic income experiments in different areas of China are feasible. The roundtable also discussed the benefits and likely challenges of implementing a Universal Basic Income in China. A large topic was how UBI could improve on the dibao system, which is China’s means-tested unconditional cash transfer program. Dibao currently has issues with targeting the subsidies toward people in poverty, which many participants at the roundtable noted UBI’s universality could potentially alleviate. Shi Li, a professor at Beijing Normal University, said Chinese people in poverty receive the dibao because of poor targeting. In his research, Li and other researchers found that nearly 88 percent of poor residents in China do not receive dibao stipends. Remarkably, administrative costs of means-testing were three times more than the actual transferred amount. The large size and economic disparities across the mainland mean it may be difficult to implement a national UBI that is not adjusted based on residence, others noted. The event was co-hosted by the International Labour Organization, which presented on the potential disruption of automation on employment during the roundtable. Haverman said an advantage in China is that smartphone penetration is high and many businesses now accept digital payments. This means it may be most efficient to send basic incomes to digital wallets. “Almost everyone has a phone, so if we find a pilot zone I think we should take a look at it,” Haverman said. Furui Cheng an associate professor at China University of Political Science and Law’s Business School, said the China Basic Income/Social Dividend Research Network is working with UNDP to plan the next steps for a pilot program in China. Cheng said they are looking to work with local governments and raise money from technology companies. “Basic income is the probable alternative for the future global social security system, which is facing unprecedent challenges now,” Cheng said. “We shall learn the experiences of global existing basic income experiments as much as possible, and we welcome any suggestions from any supporters,” she said. Yang Tuan of the Chinese Academy of Social Sciences said the size of China means it would be a good place “to come up with many types of experiments” for basic income.Tuan, who supported the implementation of dibao when she was working for China’s social security system, said the economic dynamics of China have changed since dibao started. According to Haverman, the UNDP is planning to release up to three more working papers, addressing topics such as financing UBI in China, as well as its effect on work hours. To see UNDP China’s press release, go here. To see the original UNDP China working paper, go here.